While strolling down the streets of old Bombay (read Malabar Hills) and getting some great photos for our Instagram feed, we came across an area that breathes affordable shopping. Trust us, we were as surprised as you will be. Crossing the street at Walkeshwar, we stood in front of a pristine board that reads Kamdhenu Departmental Store, and true to its name, holds everything that a structure that size can carry. As soon as you enter the store, you see rows and rows of bottles and sippers near the door, beautifully arranged, in all colours and sizes, that can’t help but grab your attention. Going in deeper, you see a section for clothing of all kind (dresses, office wear, you name it) and an enviable stationery section on the other. Apart from this, the outer area also has a kids section that has clothes, personal care (they have Burt’s Bees), toys for kids, toys for babies, prams, sleeping cots, and so much more. They also have a swimwear section with a wide range of costumes and peripherals you’d need. 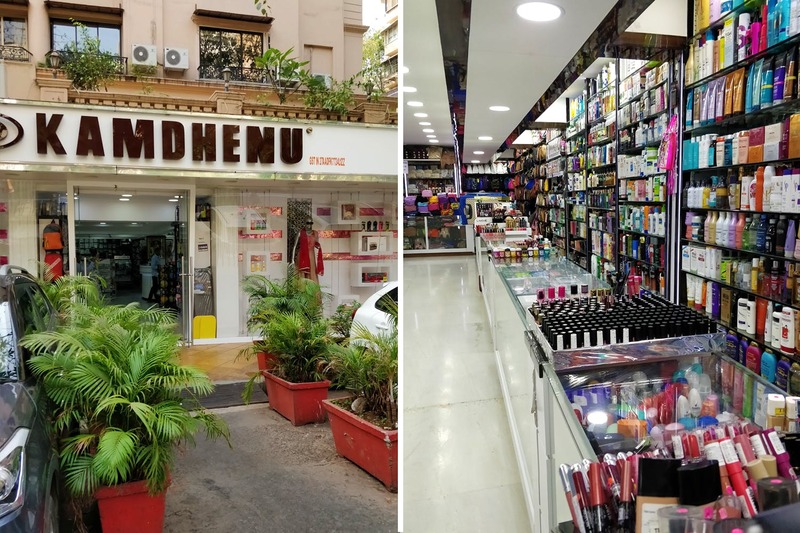 Then, you enter the inner sanctum, lined with all sorts of bindis and hair accessories on one wall, which then brings you to more clothing, home décor, decorative sandals, personal care for men and women and even accessories. It was hard to imagine so much being held in a place like this, all beautifully arranged. We found items that could cater to a number of occasions, and were affordable too – stationery boxes for INR 100, toys starting from INR 300, tops from INR 400 and even hair accessories from INR 50. What we also loved was the sheer variety when it came to all their items. If you’re ever in that side of town (visit it for Mumbai’s history) and need anything, you know where to head to. The staff is courteous and will help you out even if you just want to buy a hairclip. Now, isn’t that something?